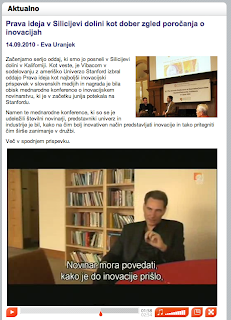 Slovenian national public TV, RTV Slovenia, broadcast a reportage from IJ-7. The reportage is made by Eva Uranjek. It is in Slovenian, but nearly all the interviews are in English, so it's interesting to watch it, even if you don't understand Slovenian. IJ-8 The Eight Conference on Innovation Journalism is a venue for researchers from many disciplines and institutions to present work and ideas relating to the interplay of journalism, communication and innovation ecosystems. IJ-8 is a meeting place for researchers and journalism/communication professionals to discuss the best ways of covering innovation in the news, or communicating innovation, the business of doing that work, and how innovation journalism and communication interacts with each other and with society. The conference welcomes a varied set of participants: Working journalists, policy-makers in innovation, academic researchers, faculty and research students in related areas of commerce, communication and journalism, and other professionals connected to the media industry. The Conference is hosted at Stanford University under the auspices of the Stanford Center for Innovation and Communication. The Center for Innovation and Communication welcomes faculty and graduate student submissions on all topics related to innovation and communication. The Program Committee welcomes strong theoretical and empirical contributions without regard to particular methodological approach, professional context (including journalism, advertising, public relations, strategy and innovation, and the standard social science disciplines) and overall orientation of the research (theoretical, descriptive, philosophical, pedagogical, methodological or practical). 1. The Grand Prinjo: best conference paper among all submissions. 2. The Junior Prinjo: best paper submitted by graduate students. 3. The Journalist Prinjo: best paper submitted by practitioners. All papers will undergo blind peer review. The review process is humane, including reasonable turnaround time on submissions and with firm but polite critique. Papers are reviewed in the order they are received and authors will receive answers as soon as the paper has been evaluated. Authors of accepted papers are expected to present their papers at the Innovation Journalism Conference at Stanford University. Authors of rejected full papers are invited to participate in the conference without presenting their work. The Conference fee is $250, including access to the conference, conference materials and refreshments. · The role of innovation journalism in ubiquitous society, and in the new era of internet of things. · The influence of the real-time web and social media in innovation communication. · How journalism and innovation interact in times of rapid change. · Towards a systems view: Public attention and attention work in innovation communication ecosystems, the stakeholders and audiences, and the interaction between these elements. · Professional norms, values, codes of ethics and principles of innovation journalism. · How newsrooms and other professional organizations affect the coverage of innovation. · Democracy and governance: The role of journalism in the innovation economy. · Who sets the agenda for innovation journalism? · Concept of attention work, the professional generation and brokering of attention. · Concept of innovation communication systems; the flow of attention in innovation systems. · How innovation processes and innovation ecosystems interact with public attention, with news media as an actor. · Interdependencies between journalism and other actors in the innovation system. · The roles of reputation and trust in the innovation ecosystem. · Business Models for innovation journalism. · Models of innovation and media, including firm, industry and economy-wide innovation systems. · Governance, accountability and innovation in and by journalists and media actors. · State of the art as well as theory and practice in the teaching of innovation journalism. · Innovation journalism and feminism. IJ-8 Chair: David Nordfors, Executive Director, Stanford Center for Innovation and communication. IJ-8Academic Program Chair: Kirsten Mogensen, Associate Professor, Roskilde University. IJ-8 Academic Review & Publication Chair: Turo Uskali, University of Jyväskylä, Finland and Senior Research Scholar, Stanford Center for Innovation and Communication. Professor Jari Ojala, Department of History and Ethnology, Uni of Jyväskylä. Professor Antti Hautamäki, Agora center, University of Jyväskylä. Author, journalist Jane Jordan-Meier, President/Owner at Jane Jordan & Associates, California. Doctoral student Kevin Perry, Roskilde University, Denmark. Doctoral student Bettina Maisch, Institute for Media and Communication Management at University of St. Gallen, Schwitzerland. Doctoral student Katrin Tobies, University of Leipzig Insitute for Communication and Media Management.